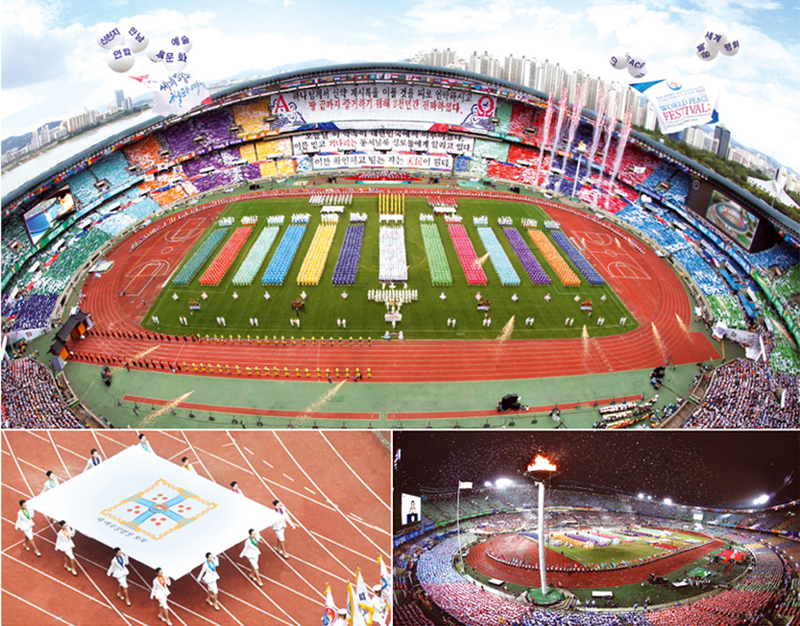 On September 26, 2012, the 6th World Peace Restoration of Light, Culture of Heaven, Art and Sports Festival was held at Jamsil Main Stadium for the peace of all mankind. Shincheonji, which has consistently hosted the World Peace Restoration of Light, Culture of Heaven, Art and Sports Festival, held the festival for world peace and the restoration of light to serve all humanity according to the will of heaven, just as light, rain and air does. The Art and Sports Festival, which was held with the Olympic spirit hoping for peace through the spirit of love and justice for the cessation of war, had 20,000 participants who hoped for world peace and the restoration of light. It was an unprecedented event that marked the end of wars of the physical realm as well as the religious wars of the spiritual realm; it was a festival for the spirits and was in line with the origins of the ancient Olympics that perfectly depicts the culture of heaven. The main image of the emblem is that of a holy flame and the blue earth that it illuminates. The torch has the motif of the sun, moon and stars that shine brightly onto the dark world and it has the initials SCJ, for Shincheonji, which heals the world with light. This burning flame of the heavenly culture defeats the darkness at the center of the earth and bring world peace to the world. A-li and O-mi come directly from the pronunciation of the words of alpha and omega, “ah” in A-li from alpha and “oh” in O-mi from omega. Alpha and omega, which has the meaning of "the creation of heaven and earth,” has been realized through us. The Seoul Olympic Stadium, which can hold up to 100,000 people at once, is a masterpiece of Kim Su-Keun, one of the representative architects of Korea. It was especially designed by applying the graceful curves of Joseon white porcelain and scientifically designed in order for 100,000 people to be able to leave the stadium in 30 minutes by separating the first and second floors and distributing 54 entrances.